It has been a long time since I have posted any specimen art. I was going through withdrawal! 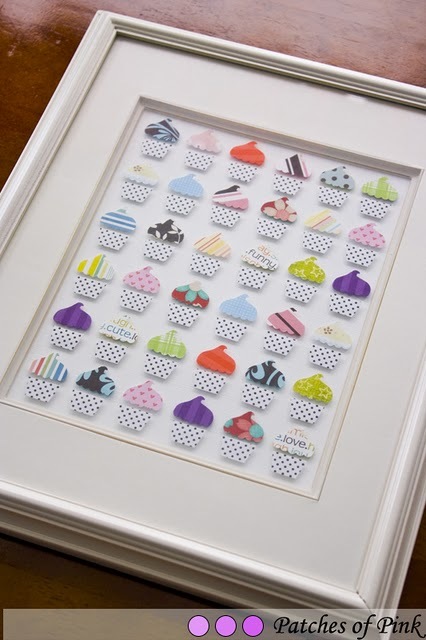 Luckily Patches of Pink came to the rescue with this super cute cupcake specimen art. It is a fun way to use up your patterned paper scraps too! And it would be s really fun birthday card! You can see her tutorial HERE. How adorable! I'm amazed at how straight it all is. I can't imagine lining them all up. That is adorable. You post the cutest things! Thanks Katie!! Pamela, I wonder if she used a ruler! But I agree...all those little pieces...mine would NOT be that straight!